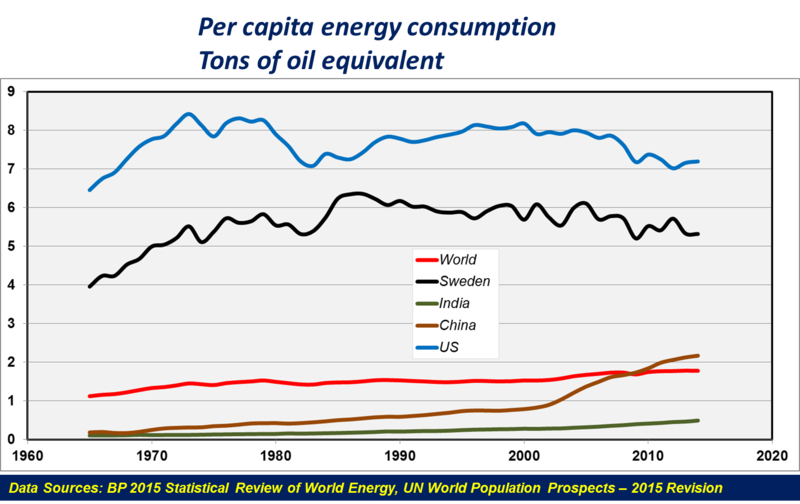 Taking the data available in the BP 2015 Statistical Review of World Energy and the UN’s World Population Prospects – 2015 revision, it is simple arithmetic to see the current disparity in the energy consumed at the individual level. 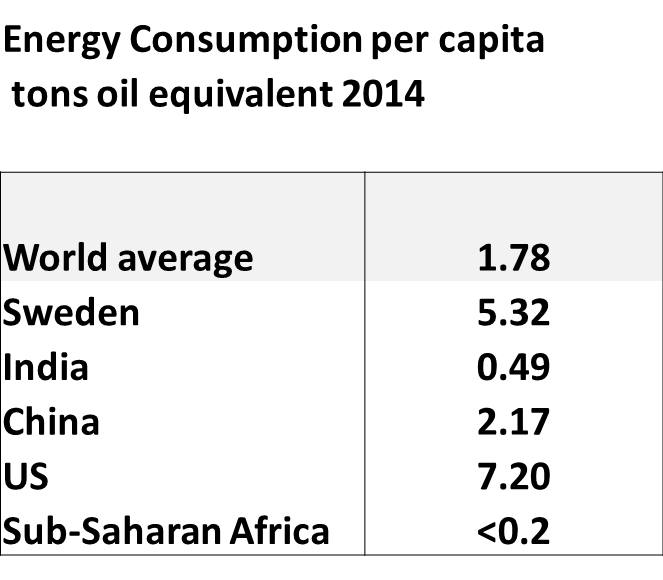 Per capita energy consumption in tons of oil equivalent varies from less than 0.2 in sub-Saharan Africa to over 7 in the US. China has already developed to consume 2.17 toe per capita, a little above the world average of 1.78 toe. The sharp growth came around 15 years ago. India is still at 0.49 toe/capita and the sharp growth is just beginning now. Probably India will exceed the world average in about 15 years. Sweden is at over 5 toe/capita and the US lies over 7 toe. The per capita energy consumption is a good reflection of the state of development. The developed countries flattened out after the 1970s. There ought to be a slight reduction in developed countries as energy efficiency effects kick in, and this effect is just starting to be apparent. Suppose now that an average per capita consumption of around 3.5 toe is a reasonable goal to meet the aspirations of the global population by 2100. The global population will then be about 10.5 billion compared to the 7.2 billion in 2014. The total energy consumption will then increase by a factor of 2.9. Currently 86% of global energy consumption is from fossil fuels. Suppose that by increased use of nuclear power and a much greater use of hydro, wind and solar power, the dependence upon fossil fuels can be reduced to – say – 70%. This is overly optimistic as to the potential of these other sources and does not seem very likely, but I use 70% to make the calculation. That would then require a fossil fuel consumption level around 2.3 times the present consumption by 2100. That in turn requires just a 1% growth of fossil fuel consumption per annum for the next 85 years. This is eminently doable – unless the alarmists, most of who already enjoy a consumption level of greater than 5 toe/ individual, manage to hold down the billions now trying to improve from levels less than 1 toe/capita. Nobody who consumes more than the world average of 1.78 toe/individual should be allowed to comment on the energy use of all those who lie below that average. This entry was posted on November 6, 2015 at 3:27 pm and is filed under Alarmism, Coal, Energy. You can follow any responses to this entry through the RSS 2.0 feed. Both comments and pings are currently closed.